This was a very risky make.The fabric is from the home of Indonesian batik, Jogyakarta, on Java, on the other side the world. I bought it last October. There was absolutely no option to go back and get more fabric. 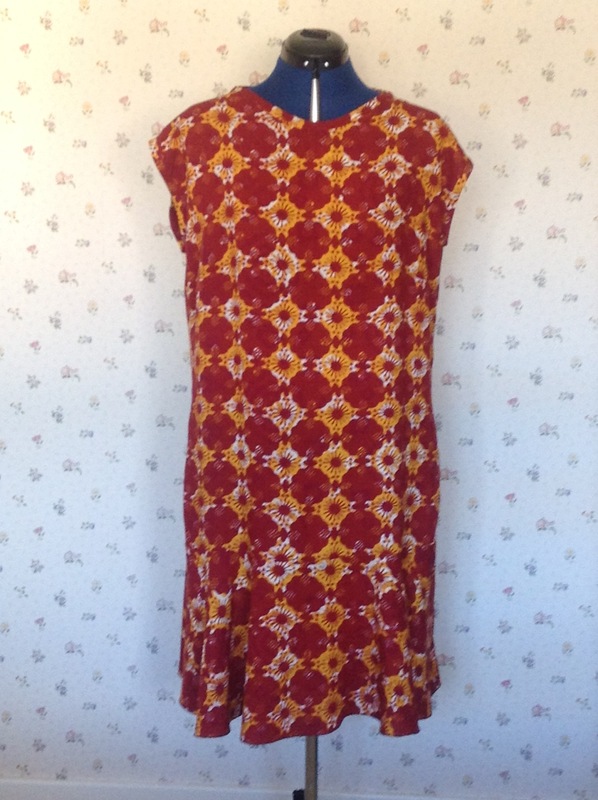 Since this is very much about the fabric, I wanted to make a garment from an interesting pattern which would show off the fabric and not cause me major headaches with pattern matching. I have had some headaches with pattern matching, so I didn’t totally succeed there! But I did have a part made toile which fitted me nicely, so that’s a good start. Making that first cut into your fabric is always a bit scary. This was even more scary. But there is no use in spending good money on lovely and unique fabric if you are not going to be brave and use it, so , I cut. I studied the fabric for some time trying to work out whether there was a repeating pattern or whether every splodge was unique. I concluded it was unique, which is half the fun of batik. Real batik should have evidence of dripped wax and should have slight variations. It’s an art; not a science. I should know; I tried it for myself. In principle making up the dress is quite simple. Machine sewing time is a matter of minutes, or at least that’s what I thought. I had a few construction decisions to make. How to finish the neckline and sleeves? 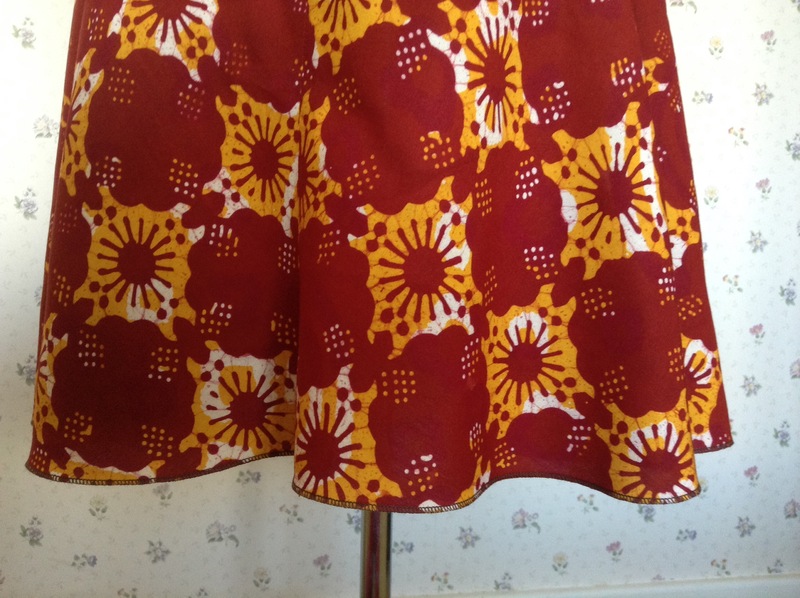 How to finish the skirt hem? I had generated facing pattern pieces whilst on my course, although the toile didn’t need to go that far. But wanting to make the best of my special fabric, I decided that I would make my own bias binding. My original intention was to bind on the inside, but the neck shaping didn’t lend itself to that solution, so I ended up folding the binding over the edge, and think the result is pretty good. I had lowered the front neck. The original shape looked as if it might throttle me. This also made the curve at the shoulder seam more manageable for binding. I particularly like the bound sleeves, although getting the join right at the top if the side seam needed some care. The trouble originated from the fact that both the right and wrong sides are the same. Even though I labelled my pieces, once I had removed the paper pattern, I lost track, and I think that I stitched the front the wrong way round. That’s not a problem in itself, but it had implications for the skirt sections when it came to lining up light and dark splodge rows! So how much of a perfectionist am i? 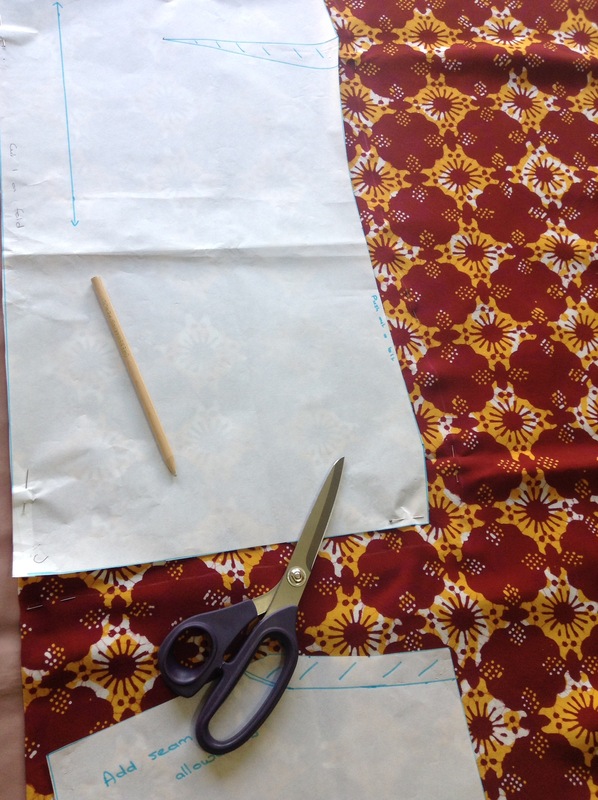 Professionally I would say that I am not a perfectionist, but when it comes to sewing……. In this case I decided to go for something close to perfection, bearing in mind that this design is an art, not a science! 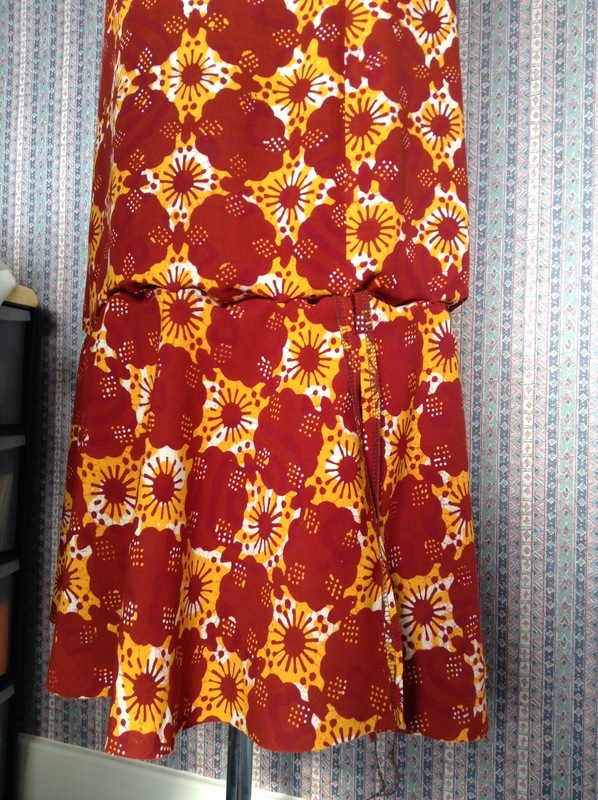 The skirt side seams didn’t hang right either. I’m not sure why not, as the toile hangs perfectly. But then the toile is made from cheap polycotton; not irreplaceable dyed batik cotton. I unpicked the side seams 3 times and stitched the waist 2 1/2 times. Hence, the total sewing time turned out to be well over a ‘few minutes’. How to finish the hem? 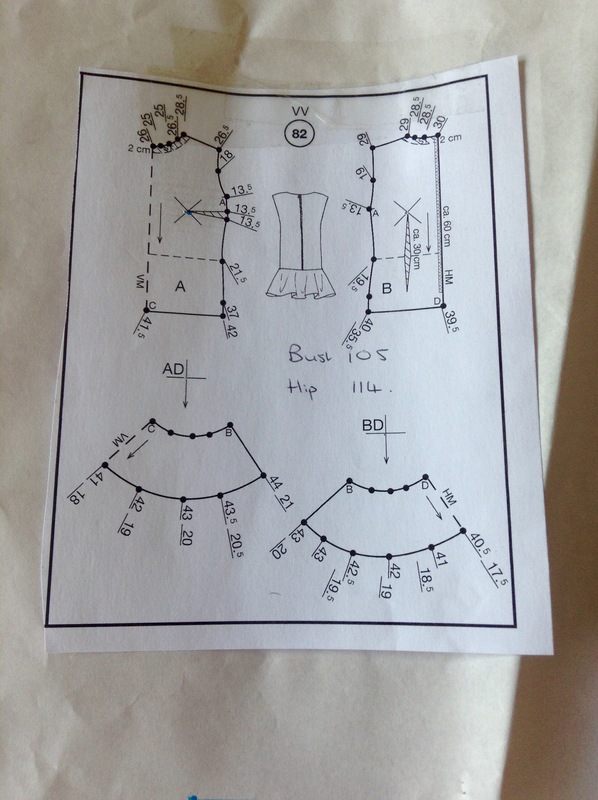 A lot of patterns don’t tell you exactly how to finish the hem, so maybe this isn’t a problem deriving from Lutterloh. The fabric hangs well, and I didn’t want to spoil that. I used a scrap of fabric and tried 4 different methods of finishing. 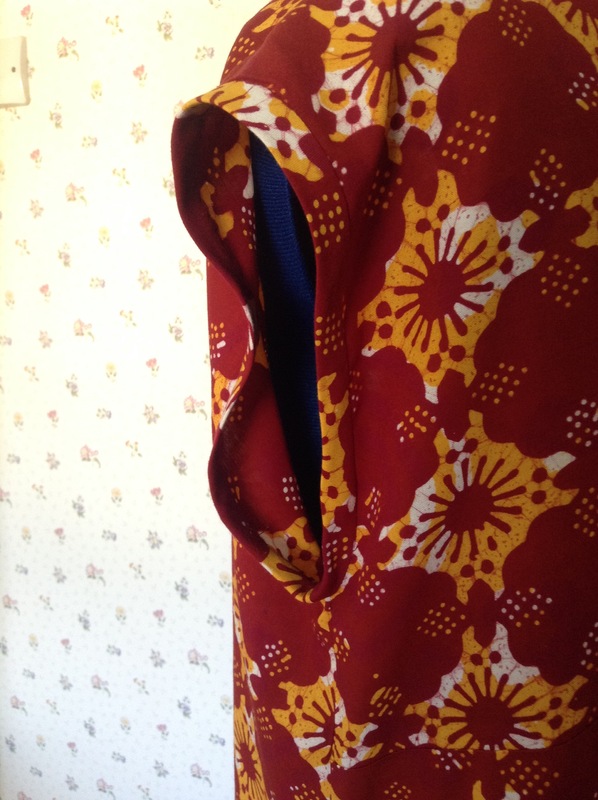 Clearly the best one was to use a rolled hem on the overlocker. I have used it before for fine fabric, but not on anything this ‘thick’. Now I used a limited range of thread colours with my overlocker. The majority of the time, the results are on the inside, so I use the most appropriate ‘match’. Of course, my colour range does not include a shade of burnt red / orange. In the end I used the brown that I had used inside, and I am pleased that I did, as it is hardly noticeable, especially from a distance. And it was very quick to stitch. It’s a rather special dress. I look forward to wearing it. This entry was posted on May 9, 2017 by ann hebden in Batik, Dresses, Handmade, Indonesia, lutterloh, Sewing and tagged Batik, Dress, Handmade, Indonesia, lutterloh, Sewing.